Similar politicking has been going on for years in cities and counties across Colorado’s Front Range. Many of the new neighborhoods were built alongside, and often in the middle of, existing oil and gas fields in the Niobrara Shale, and the oil industry has seen a resurgence thanks to advances in hydraulic fracturing and other technology. Now, instead of worrying about long-term threats like air and water pollution, cities and counties have to ponder whether Colorado’s unusual mix of oil fields and rapid residential growth is endangering people’s lives. In the new environment, the oil industry’s normal arguments about the economic necessity of oil and gas development may be a harder sell, particularly in affluent suburbs like Broomfield, said Seth Masket, a political science professor at the University of Denver. “It’s hard for the energy industry to argue that regulations are killing jobs when the economy is so strong in many communities,” he said. The April 17 explosion happened in Firestone’s Oak Meadows neighborhood, a new subdivision that was built adjacent to a group of gas wells drilled in the 1980s and 1990s. Investigators determined that a pipeline serving one of the wells was improperly cut off, just a few feet from a house built in 2015. The pipeline was still connected to a nearby gas well and allowed gas from the well to seep into the home’s basement. The owners, Mark and Erin Martinez, were in the house when the gas exploded. Mark Martinez and his brother-in-law Joey Irwin were killed, and Erin Martinez was flown to a hospital after a construction crew and other bystanders rescued her from the burning wreckage. 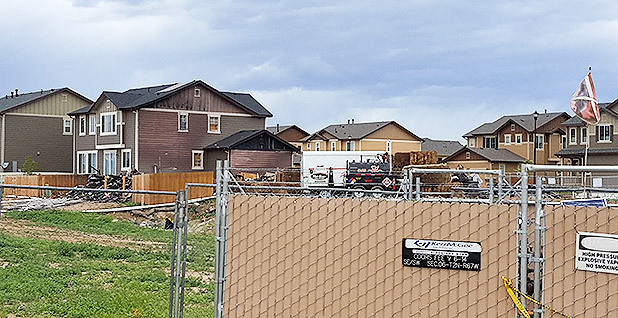 The accident highlighted how the Front Range’s population growth has pushed residential development into the oil patch. The population of Weld County, which includes Firestone, grew 17 percent between 2010 and 2016, to about 295,000. Its oil production grew almost fivefold during the same time, to 282,000 barrels a day. Over the next few years, other communities passed temporary and permanent bans, either at the ballot box or in local ordinances. Broomfield’s five-year ban passed in a referendum in 2013; the vote was so close, it took more than a week to determine whether the ban had been approved (Greenwire, Nov. 15, 2013). Colorado Gov. John Hickenlooper (D), along with the oil industry, argued that local communities can’t block oil and gas development, and that the state has primary authority over energy regulation. The City Council in Broomfield, a relatively wealthy community that features big homes on large lots, has been wrestling with an oil company’s drilling proposal for more than a year. During a May 23 meeting to discuss the task force’s progress, Extraction appeared to have won over both the task force members and most of the City Council. The company plans to drill with an electric-powered rig, sound walls and specially designed equipment to reduce the normally thunderous sound of the fracking process. The sites will be screened by earthen berms, landscaping and fences. 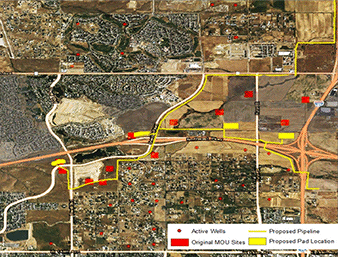 And perhaps most importantly, in the wake of the Firestone explosion, Extraction plans to shut down 41 vertical wells that are interspersed with Broomfield’s neighborhoods. Some of the old wells are less than 200 feet from the surrounding homes, and many of them date from the same era as the wells in Firestone. The negotiations have gotten tougher since the Firestone explosion, said Pat Quinn, a former mayor of Bloomfield who’s part of the drilling task force. “It just adds a seriousness to it,” he said. Anderson, who helped gather signatures to force the election, said her experience has been typical of a lot of drilling critics. She and her husband bought a home in Broomfield about two years ago and didn’t realize how much the oil and gas industry was expanding. Suddenly, the city was considering allowing dozens of wells on a site near her home that previously had only one well. “It’s just a surprise that something like this could even happen,” she said. At least two of the Broomfield residents who filed the petition live in Anthem Highlands, one of the neighborhoods that would be affected by Extraction’s drilling plan, according to a news release. “Why wouldn’t we want to give local government the authority to preserve our safety?” McNaughton said in an interview. The petition is asking Broomfield to adopt a similar legal standard to one that arose out of a statewide court case. The suit, Martinez v. Colorado, challenged the state’s historic approach of balancing the oil and gas production against the impact on human health and safety. A trial court rejected the argument, but a state appeals court sided with the plaintiffs. Hickenlooper, under pressure from local governments, urged the Colorado Oil and Gas Conservation Commission (COGCC) not to appeal the decision. Last month, the state’s Republican attorney general, Cynthia Coffman, opted to appeal the case to the state Supreme Court (Energywire, May 19). But the explosion pointed out a gap in the state’s oversight. The COGCC has good information on oil and gas wells, but it doesn’t have accurate records of the type of pipeline linked to the explosion, known as a flow line (Energywire, May 3). There’s been more negative news for the oil industry in the last few weeks. Soil tests found a second underground pipeline leak in the Oak Meadows neighborhood in Firestone, according to the COGCC. The line was a branch of the same pipeline that was cut off near the Martinez home. It, too, had been improperly cut off and left uncapped, although regulators said it didn’t pose a danger to nearby residents (Energywire, May 30). Ultimately, the explosion could persuade some communities to challenge the state’s primacy over drilling regulations, said Mike Freeman, an attorney for Earthjustice who has worked with local governments. Mike Foote, a Democratic representative from Boulder County who sponsored the pipeline mapping bill in the recent session, said the oil industry needs to acknowledge that many people simply don’t want to see drilling close to neighborhoods, even if it means that some oil and gas can’t be developed. “It doesn’t make sense to put a heavy industrial operation in the middle of a neighborhood,” he said. “That divide isn’t going to go away,” he said.